Fog rolled into our coastal community last week. 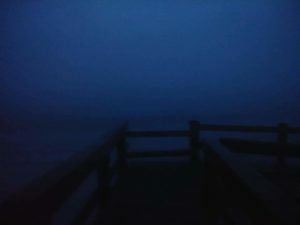 I walked in the early morning onto the wooden access ramp and looked out toward the beach, but couldn’t see the ocean. 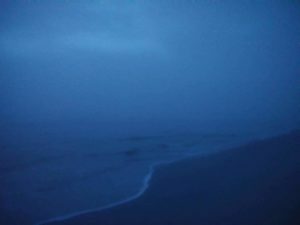 It was a bit eerie because the sound of the pounding surf was deafening, so it was obvious that the ocean — a mere hundred yards away —was not only there, but also active and angry. Yet in spite of all the sound and fury, my ability to see the waves and water was obscured by the dense fog. I think Paul’s reminder of the unseen forces all around us is really a call to sobriety and vigilance. We sense a resistance and experience the struggle as we seek to follow Jesus in a broken (but beautiful) world. We don’t need to fear or obsess on our spiritual adversaries (who, if the scriptures are to be trusted, are already defeated), but we better remember that they are there, aiming to derail us and divert our pursuit to lesser things. Paul elsewhere reminds us that “now we see through a glass darkly” (1 Corinthians 13:12 KJV). I get that, and don’t go a day without being reminded how partial my knowledge is. Sometimes I see what is in front of or around me more clearly, but other times it’s as if I’m shrouded in fog like that morning at the beach. That’s why the reminder about the unseen powers with which we struggle is helpful to me. The best part, however, is that even though our vision may be obscured and there is so much that we do not know or understand, we ourselves are nevertheless fully known: “…Now I know in part; then I shall know fully, even as I am fully known” (1 Corinthians 13:12). And, the One who knows us fully does not seek our harm, but rather loves us unconditionally, gives us life, calls us to better our world, and appoints us as ambassadors driven by love to bring hope and a message of reconciliation for those around us who may have lost their way (2 Corinthians 5:14-20). He also promises that he is making preparations for us so that when our good work is done and we emerge through the spiritual haze onto our final shore, he will be there to welcome us home (John 14:1-3). Through my first book "Living Jesus' Way" I hope you will come away with a practical understanding of Jesus’ words which, if applied, will change the course and trajectory of your life, no matter who you are or where you find yourself. Come and see life as you were meant to live it. Copyright © 2019 Chris Hazelip. All Rights Reserved.